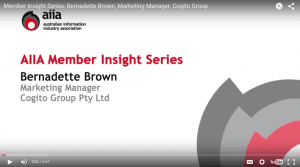 Bernadette Brown, Marketing Manager from Cogito Group, explains that we use enabling technology which keep your physical, logical and cloud based data and infrastructure safe. What is your view about the role of digital technology in driving growth, productivity, competitiveness and overall social benefit? 5 key policy priority areas that AIIA are focusing on this year: Skills, Innovation, Government Digitisation, Privacy and Security and Internet of Things. Which of these 5 priority areas is most important to Cogito Group? Click here to find out the answers and watch the video.